London, Chapman & Hall, 1956. FIRST EDITION. 8vo, pp. 224. 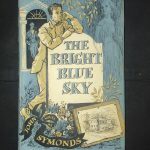 Blue buckram, gilt-tooled lettering on spine, and original illustrated dust jacket. 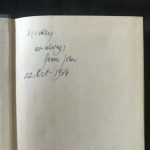 Inscribed by the author on endpaper and dedicated to his friend scholar and poet Michael Hamburger: “Mickey / as always / from John / 22 Oct 1956”. A fine copy.